Leaving the broad shoulders of Astoria for a days hike, your humble narrator found himself at the Corona Yard staring over a fence at some of the MTA’s less familiar kit. 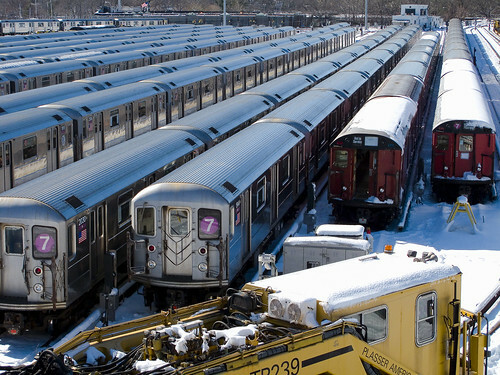 This is where the 7 train sleeps, and also where one can observe an assortment of “work trains”. Said “work trains” are specialists, non passenger, and rarely seen or commented on by the public. 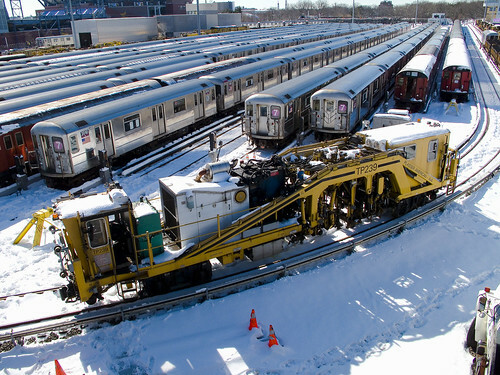 While crossing the pedestrian ramp from Roosevelt Avenue to Flushing Meadow Corona Park, I was on the lookout for the “snow train”, but that wasn’t what I found. 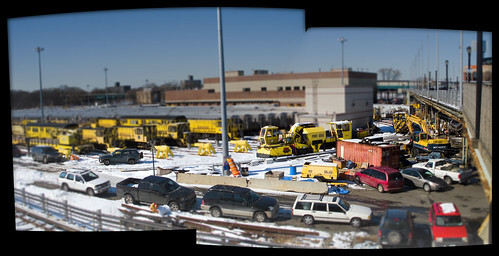 “It’s like your household snow blower but a million times bigger,” agency engineer Edward Macina said late Wednesday as the five-car diesel train chugged past the silent expanse of Kennedy Airport. 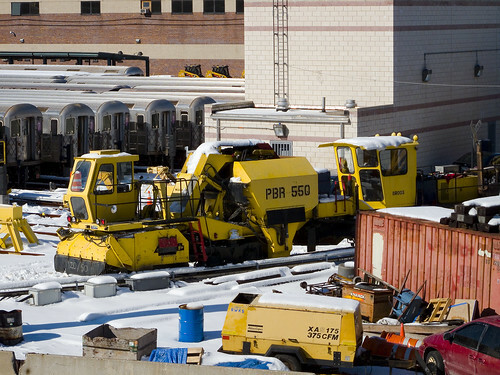 The train is a key component in the agency’s comprehensive snow-battle plan. A six-foot cylindrical brush attached to the front sweeps snow into an even wider metal tube. Snow is then blasted away — far away — from the rails from the mouth of a chute about eight feet in the air. The machine can launch the snow 200 feet, removing 3,000 tons of snow an hour. Macina, project manager in the car equipment department, joked ‘Snow Eater’ might be an appropriate nickname. Corona Yard is a rail fan’s dream. Active rolling stock sits quietly in the sunlight next to a historical catalog of the MTA’s former workhorses and modern utility trains. Corona Yard is the yard facility in Flushing, in the New York City borough of Queens, that serves the IRT Flushing Line (7) of the New York City Subway. It is located in Flushing Meadows-Corona Park, near Citi Field, the National Tennis Center, and the site of the 1939 and 1964 World’s Fairs. Corona Yard opened in 1928 and has seen various models of cars, including Steinway Low-Vs, Brooklyn-Manhattan Transit Corporation/BMT Qs, R12s, R14s, R15s, World’s Fair R36s in 1964, and R62As. It also contains the Casey Stengel Bus Depot. On August 16, 2006, the original 1928 shop building was demolished, and was replaced by a new, modern shop. This mechanism, for instance is a “Ballast Tamper”, which is a track maintenance and repair unit. 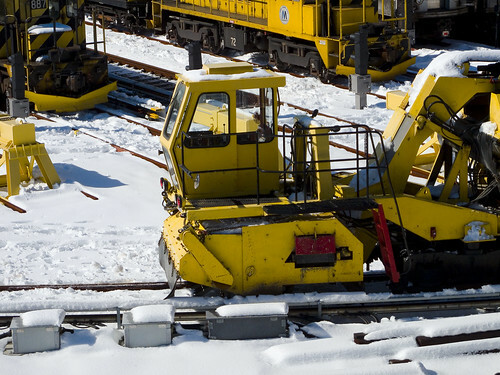 A ballast tamper or tamping machine is a machine used to pack (or tamp) the track ballast under railway tracks to make the tracks more durable. Prior to the introduction of mechanical tampers, this task was done by manual labour with the help of beaters. As well as being faster, more accurate, more efficient and less labour-intensive, tamping machines are essential for the use of concrete sleepers since they are too heavy (usually over 250 kg) to be packed into the ballast by hand. Early machines only lifted the track and packed the ballast. More modern machines, sometimes known as a tamper-liner or tamping and lining machine, also correct the alignment of the rails to make them parallel and level, in order to achieve a more comfortable ride for passengers and freight and to reduce the mechanical strain applied to the rails by passing trains. Hey, those are “Redbirds” back there, weren’t they all supposed to be coral reefs by now? Redbird is the name given to 1,408 New York City Subway cars of the following types: R26, R28, R29, R33 ML, R33 WF, R36, and R36 WF. These cars were painted a deep red to combat graffiti, which had become a major problem In the late 1970s and early 1980s. The deep red color was referred to as Gunn Red in honor of its originator David L. Gunn, who was the head of the New York City Transit Authority during this period. Initially entering service in various colors, these cars received the new paint scheme between 1984 and 1989. Some R17s were also given this paint scheme in 1985/86, but were retired well before the name “Redbird” caught on. This long walk from Astoria to Flushing Meadow Corona Park will be explored in the coming days, here at your Newtown Pentacle, in the first postings of this new “Year of the Metal Tiger“. A ballast regulator is a piece of rail transport maintenance of way equipment used to shape and distribute the gravel track ballast that supports the ties in rail tracks. They are often used in conjunction with ballast tampers when maintaining track. I’ve taken that walk, not along Roosevelt, but along the entire length of Astoria Blvd. It’s a fun trip, although not particularly Newtown-centric. It’s a long walk, my friend. I prefer to pick my way along Woodside, Jackson Heights, Elmhurst etc.’s borders. Do Roosevelt sometime, it’ll actually make you believe in America again.